Introducing the New College Savings Planner on Savingforcollege.com! Home	// College Savings 101 // Articles // Introducing the NEW College Savings Planner on Savingforcollege.com! With average tuition, fees and room and board close to $19,000 this year for a four-year public school, and $42,000 for a four-year private school, preparing for future college costs is becoming more and more crucial. Yet many families struggle when it comes to developing an effective college savings strategy. If you’ve been regularly putting money away, that’s certainly a good start – but how do you know if you’re saving enough each month? And while you might know the sticker price of your desired school, do you know how much a student actually ends up paying if you take financial aid into consideration? What about your method of saving – regular bank account, mutual fund, 529 account? At Savingforcollege.com, it’s our mission to help families and individuals better understand how to meet the challenge of paying higher education costs. Over the years we’ve done a good job providing you with information, but it’s now time we take things one step further. Just in time for your year-end planning, we’ve launched the College Savings Planner, an innovative tool that allows parents and grandparents to design a customized savings strategy intended to meet their specific goals. It’s time to change the way you think about college savings. The College Savings Planner needs to get to know you, which means you’ll start by entering some information about your family and the person you are saving for. This includes your home state, household income, tax filing status, type of school or specific school you are saving for and the name and ages of who you are saving for. Why do we need to know all of that? Well, there are a lot of factors that go into planning for college. The potential tax savings offered by a 529 plan will vary depending on where you live and your family’s financial situation. There are also dramatic differences in the costs of private versus public and two-year versus four-year schools. Based on your inputs, the Planner looks at the historical costs of the school or type of school you’re saving for and calculates a personalized savings goal. The amount you need to save is comprised of estimated future tuition, room and board, books and supplies and other expenses. What’s more, the Planner will also tell you how much of these costs are typically covered by grants and scholarships and how much families actually pay out of pocket. [INFOGRAPHIC] How Much Do You Need to Save For College? Now that you know how much money you’ll need for college, let’s talk about how to make it happen. There are a variety of savings vehicles available, but we feel 529 plans are the best way to grow an education fund. Need to see it to believe it? That’s where the Planner comes in. You tell it when you plan to start saving, and what your initial and monthly contributions will be, and it will illustrate your annual balance of saving with the average 529 plan, savings account and mutual fund in an easy-to-read chart. In most cases, your annual 529 balance will be higher than a savings account or mutual fund. A 529 plan is an investment account, which means it typically has greater growth potential than a regular savings account. What’s more, that earnings growth is federal tax-free and you won’t pay taxes on withdrawals if the money is spent toward college expenses. Many states also offer additional state tax breaks for residents. Mutual funds, however, give up a portion of their earnings to annual income tax, and the when the shares are sold investors are hit with a capital gains tax. There are hundreds of 529 plans available. That’s right, HUNDREDS. So when you have a few hours of free time, you can decide if you want a direct-sold or an advisor-sold plan, look up each plan’s performance, fees and rankings, and of course and look at each plan’s Savingforcollege.com 5-Cap Rating (which measures the flexibility, investments, performance and economic benefits such as tax benefits of a plan). Or, you can let the College Savings Planner do the work for you. 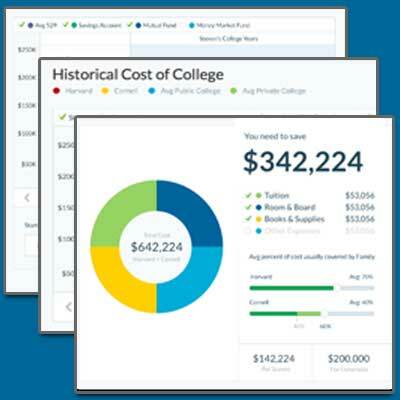 Instead of sifting through hundreds of plans, you can filter your search to view plans in your home state or plans with a Savingforcollege.com 5-Cap Rating of 2.5 – 5 graduation caps. You can also choose how you want the Planner to sort your results: by ability to enroll directly, ranking, 5-Cap Rating, performance or cost. The result? A condensed list featuring everything you need to make an informed decision about how to plan for college costs. From here, some plans will allow you to "enroll now" and sign up for your ideal plan immediately. If you prefer to think it over first, or want to consult a financial professional, no problem – with a simple click of a button your results will be saved, and a link will be emailed to you so you can access them again any time you’d like. Try out the College Savings Planner Today!